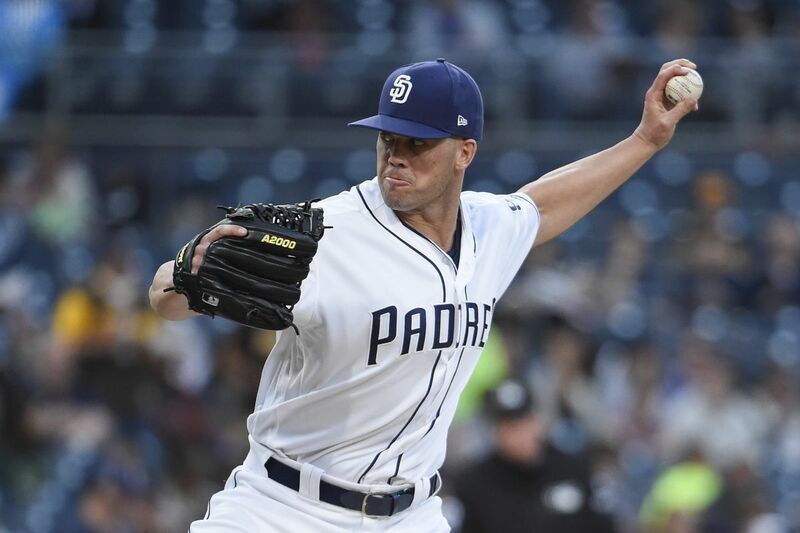 The Padres ensured themselves a split of the four-game series with a 3-2 walk-off victory over the Marlins on Wednesday night. It was a quiet day on offense for both teams, as each starting pitcher went at least six innings and gave up no more than two runs. Clayton Richard provided the team with another quality start, going seven innings and striking out five. Richard cruised through three innings, getting five of the first nine outs on the ground. He ran into some trouble in the 4th, allowing a single to J.T. Realmuto before giving up a home run to Starlin Castro. The Padres answered back in the bottom of the 4th inning. 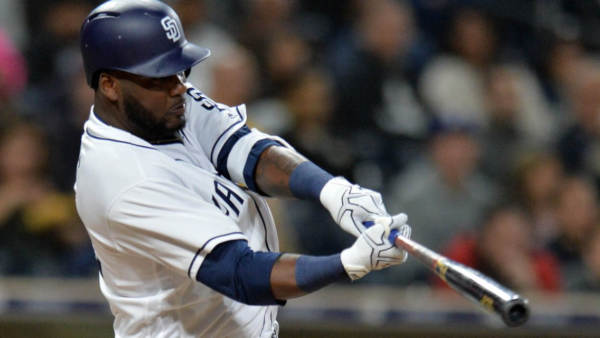 After seeing Eric Hosmer and Christian Villanueva strike out to begin the inning, Franmil Reyes went deep for his 4th home run on the season. The home run was his third in as many days. Matt Strahm entered the game in the 8th inning. He went two innings without allowing a hit or walk and struck out one. The outing lowered his ERA to 3.18 on the season. The score stayed 2-1 until the bottom of the 9th inning when the Padres loaded the bases against Marlins’ reliever Brad Ziegler. Franmil Reyes walked to lead off the inning. Raffy Lopez followed with a flyout to center fielder Lewis Brinson. Matt Szczur entered the games as a pinch runner for Reyes with one out in the inning. Freddy Galvis lined the first pitch he saw down the left field line for a double, just out of reach of third baseman Miguel Rojas and, with runners now on second and third, Don Mattingly decided to intentionally walk Manuel Margot to load the bases. After taking a first pitch strike at the knees, Hunter Renfroe hit a soft ground ball to Rojas at third. Rojas charged in to field the ball and double clutched as he tried to get the force at home. Rojas then turned and made an off-balance throw to first, where the ball skipped away from first baseman Yadiel Rivera. Scoring easily on the play were Matt Szczur and Freddy Galvis, giving the Padres the win 3-2. Travis Jankowski and Cory Spangenberg combined to go 0-8 with one strikeout at the top of the lineup. Eric Hosmer finished the day going two for three with a walk. Villanueva finished the day going 0-4 and leaving three men on base. Raffy Lopez failed to get in a hit and struck out twice in four at-bats. He finishes the day batting .158 on the season. Manuel Margot went 1-2 with two walks, including his intentional walk in the 9th inning. The Padres match up with the Marlins again on May 31 for the final game of this four-game series. The game begins at 6:10 p.m. PDT. Love the energy from the team on the walk off. 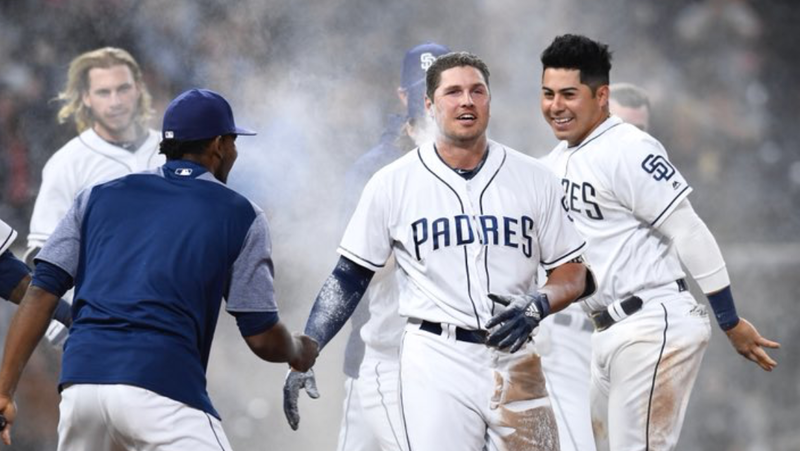 Couldn’t tell if Renfroe was cool or pissed with Villa showering him with talc, but I thought it was funny and seemed to make this team kinda come together a bit.